2015 In Review: After two years of no national title there were questions around many SEC programs. Was the conference still the powerhouse it once was after an unprecedented streak of national titles or had it slipped? In 2015, led by a familiar power, they asserted themselves as still the top conference in college football. Alabama won it all, coming from an early disappointing loss to Ole Miss to rule the college football world. The Tide ran the ball down team's throats and played incredible defense en route to Nick Saban's fourth title with the school. Other than the Tide, plenty of others still made news inside the conference. LSU was the hottest team in the conference before Heisman frontunner Leonard Fournette was swallowed up by Alabama. Florida was a major surprise from the East in Jim McElwain's first year in Gainesville and the trendiest program in the SEC West right now, Ole Miss, continued to improve with ten victories. The offseason saw an abundance of chaos in coaching, and it sets the stage for what will be an intriguing 2016 down South. It seemed everybody in America picked Tennessee to break out last season. The Volunteers had wonderful talent, and Butch Jones' team kept improving year-in year-out. However, they were still a tad young last year and while they didn't have a bad season, they also didn't quite have the breakthrough they were looking for. Even so, they are the clear frontrunner in the East, with their rich stockpile of stars. Quarterback Joshua Dobbs will keep a solid passing attack stable, but the offense will still lean heavily on backs Jalen Hurd and Alvin Kamara. The defense endures some losses, but could still be elite. Defensive end Derek Barnett could be one of the top pass rushers in the conference, while shutdown corner Cam Sutton patrols the back. Tennessee is also expecting big things from former five-star recruit Kahlil McKenzie and highly touted JUCO transfer Jonathan Kongbo on the D-Line. The Vols choked away too many games last year and that was due to inexperience and depth issues. With those problems fixed and a confident team, they could very well win the conference. After years of being good not great and losing too many close games, Georgia decided it was time to move on from Mark Richt. Richt won plenty of games in Athens, but could never quite get the Bulldogs over the top. Georgia will hope that changes under new head man Kirby Smart, who was previously the defensive coordinator at Alabama. Smart will have a tough decision ahead of him to start the year: who to start at QB. He will decide between former Virginia transfer and incumbent starter Greyson Lambert or five-star true freshman Jacob Eason. My guess is Eason, but the QB competition will be an interesting storyline for the 'Dawgs all year long. UGA should still be a run-heavy offense, and hopes that junior Nick Chubb returns healthy this season. Chubb was firmly in the mix for the Heisman last year before suffering a horrific knee injury. He has worked hard to get back to 100 percent, and appears ready to play in Georgia's opener against UNC. Even if he needs a little bit more time to heal, junior Sony Michel has proven he can carry the load. Smart will focus heavily on the defense, which was good last year but could be even better in 2016. The Bulldogs had the No. 1 pas defense in the nation last season, and return safety Dominick Sanders and corner Malkom Parrish. Up front, Georgia will be searching for new pass rushers, particularly after edge rusher Leonard Floyd left for the NFL a year early. Junior Lorenzo Carter has the huge upside to have a breakout season in Athens. 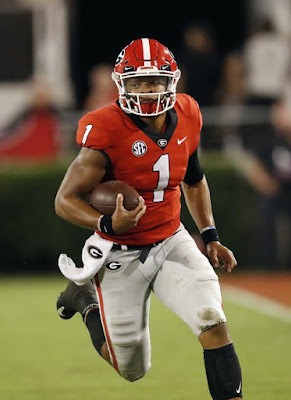 Smart has a youthful team in Georgia and faces a tough schedule in Year One, but this is the right job for him to succeed. With plenty of talent in a great recruiting state, it seems only when, not if, this program gets over the top. After a frustrating few years under Will Muschamp, Florida was a surprise in Jim McElwain's first season. 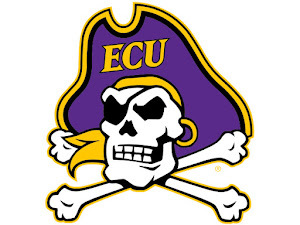 They jumped out to a very hot start and appeared to be a very serious contender for the College Football Playoff. However, things quickly cooled down in Gainesville. Quarterback Will Grier was suspended for the year for testing positive for performance-enhancing drugs and the offense struggled mightily in his absence. Backup Treon Harris never really found any rhythm, and the passing attack was non-existent for the final month. Florida hopes that changes in '16, even though Grier won't be apart of it (transferred to West Virginia), with new quarterback Luke Del Rio. The son of Oakland Raiders head coach Jack, Del Rio has previously lost quarterback competitions at Alabama and Oregon State but has loads of potential. He will rely heavily on a decent receiver corps, one headed by explosive sophomore Antonio Callaway and Harris, who moves to receiver. Both Callaway and Harris missing much of spring practice with disciplinary issues, but they appear ready t begin the year. Florida certainly hopes their offense can improve, but this is still a defensive-first team. The D-Line returns plenty of promise, and the rush defense should be led by senior Jarrad Davis, who had 98 tackles a year ago. In the secondary, Florida loses Vernon Hargreaves III, but could actually improve with a breakout from talented junior Jalen Tabor and the return of reliable safety Marcus Maye. The Gators will still have to find some success on offense, but the defense alone should be enough to keep Florida in the mix for the East crown. 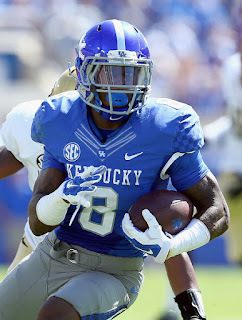 After a few years of great recruiting, it is time for Mark Stoops to finally deliver on his rebuild in Lexington. The Wildcats have started the past two years red hot, but have fallen apart in the second half, compiling two straight 5-7 marks. The goal this year is definitely to make a bowl, and they have enough talent to do just that. Sophomore Drew Barker is expected to take over at quarterback after former starter Patrick Towles transferred, and will have a good core of receivers to throw to, led by Dorian Baker. The ground attack could be very good, thanks to junior Stanley "Boom" Williams, who ran for 855 yards last season but could be even better this year. Kentucky's defense has been very inconsistent under Stoops, but has enough experience that it could be very strong this season. Juniors Matt Elam and Reggie Meant bring plenty of bulk and ferocity to the middle of the defensive line, while the linebacker corps is hoping for big things from Nebraska transfer Courtney Love. The secondary has some holes, but could still be very strong. Plenty of talent and experience mixed with a schedule that isn't absolutely dreadful, it appears it is now or never time for Stoops with UK. They should be able to continue making progress and at least eclipse the .500 mark. After 15 years at the helm in Columbia, Gary Pinkel retired from coaching dealing with a battle with lymphoma. Missouri went with a familiar name to replace him in Barry Odom, a former Mizzou linebacker. Odom will hope to re-energize a stagnant offense from a year ago. Sophomore Drew Lock will lock down full quarterback duties after previously suspended starter Maty Mauk left for Eastern Kentucky. Ish Witter and Nate Strong, a four-star newcomer, will bring stability to the ground attack, while Missouri adds in Alabama grad transfer Chris Black at receiver. Odom is a former Tiger defensive coordinator, so he will focus heavily on the defensive side. He has plenty to work with, namely edge rusher Charles Harris. Harris has physicality, strength and a high motor, and can play either end or outside 'backer. He'll be helped by a strong crop of veterans patrolling the front seven. Senior middle linebacker Michael Scherer (93 tackles in '15) could be one of the conference's leading tacklers. Overall, Missouri should make some progress this season after slipping to a 5-7 record a year ago. But, the offense will need to find their tune and the defensive backfield must improve for the Tigers to lock in much more than a bowl berth. It may not have been Coach of the Year-worthy but Derek Mason did a fine job with Vanderbilt in his second season in 2015. The Commodores still struggled, but improved from three wins to four wins this past season, which included plenty of close contests. They could contend for the bowl berth in Mason's third year, if they lock down a quarterback. Sophomore Kyle Shurmur appears to the frontrunner to take over the ever-important job, but junior Wade Freebeck has a high upside. Junior back Ralph Webb could be one of the most underrated backs in the country, and will operate behind a solid offensive line. The defense still struggles at times, but played pretty well overall last season. Junior Zach Cunningham is among the top defenders in the nation at linebacker, and fellow junior Nigel Bowden also joins him. The secondary also has plenty of talent and experience. The Commodores continue to make strides under Mason. A bowl appearance would be the most logical, attainable step in 2016. After a very successful tenure with South Carolina, Steve Spurrier opted to step down as head coach last season, in the midst of a brutal season in Columbia. He will be replaced by Will Muschamp, who has a lot to prove after he struggled in his first stint in SEC East football at Florida. Muschamp inherits a team that needs a lot of work, but also a program that has proven it can win big when handled the right way. First things first, Muschamp must find an offense that disappeared last year, particularly a quarterback. Senior Perry Orth is likely the favorite, but highly touted true freshman Brandon McIlwain has impressive talent and by the end of the season could be their guy. Muschamp must also hope some receivers step up after the Gamecocks lost one of their best playmakers in Pharoh Cooper. Defensively, South Carolina has talent, namely senior middle linebacker Skai Moore, who will be a tackling machine in 2016. The pass rush lacks any big names, but could still be a good group with a number of veterans returning. The Gamecocks are inexperienced this season, and it could be understandable if Muschamp struggles. Inside an SEC East that is the deepest it has been in awhile, ending up in the cellar could be a real possibility. Alabama proved they were still the program to beat in the SEC last season, winning the conference in impressive fashion before taking home the College Football Playoff Championship. Not surprisingly, they were hit hard by the NFL Draft and graduation, and lose their quarterback, running back and a number of elite defenders. Even so, Alabama is still widely being picked to win the conference once more in 2016, in large part because of what they have elsewhere talent-wise. Alabama returns perhaps the SEC's top receiver corps, led by sophomore Calvin Ridley and senior tight end O.J. Howard along with a dominant offensive line. Their defense is headlined by defensive end Jonathan Allen, linebackers Tim Williams and Rueben Foster and a secondary full of stars. The only question in Tuscaloosca is the quarterback position, where OC Lane Kiffin is looking for his third starter in three years. Cooper Bateman, a junior, is the favorite to start but will get pressure from a wide range of candidates, namely Blake Barnett and David Cornwell. Whoever takes over the reigns of the offense will have enough talent around them that Alabama should still be firmly in the mix to repeat as National Champs. After a three-game losing streak near the end of last season threatened to end Les Miles' tenure, LSU responded by winning their final two games in impressive fashion. That ending, and the talent they return, has them very hopeful for a breakout in 2016. The Tigers return perhaps the nation's best player in junior Leonard Fournette, who bulldozed over opponents en route to 1,953 yards and 22 touchdowns last season. They also have a great 1-2 punch at receiver, in seniors Travin Dural and Malachi Dupre, and a strong offensive line. The question on the offensive side of the ball is quarterback. Junior Brandon Harris is the returning starter, but he needs to do more than complete 54 percent of his passes and average 180 yards a game, especially with prime talent around him. Harris will start the year, but if he struggles Purdue transfer Danny Etling could push him. LSU doesn't need the junior to be chucking the ball 50 times a game for 500 yards, but they need more consistency from him in order for their offense to gain some balance. Defensively, LSU has their usual NFL-level talent everywhere. The line is led by sophomore breakout candidate Arden Key and junior tackle Davon Godchaux, while the secondary includes corner Tre'Davious White, Jamal Adams and rising sophomore Kevin Toliver II. That defense, mixed with the running game, will be able to keep the Tigers in every game and in the SEC West hunt. If the passing game can take the next step, this team has all the ingredients of a National Championship team. Ole Miss has improved their win total every year since head coach Hugh Freeze has gotten here, but there is no denying they've had a tough offseason. Not only did they see a number of key contributors leave in the NFL Draft, former left tackle Laremy Tunsil's draft night incident opened the door to NCAA investigation and questions surrounding the program. Even with that still happening on the field, the Rebels have proven they can reload, and they should still contend. Senior QB Chad Kelly proclaimed himself "best quarterback in the nation" a few weeks ago and has the arm and playmaking ability to back it up. He will be helped by a strong receiver corps, led by junior Damore'ea Stringfellow and senior Quincy Adeboyejo, along with tight end Evan Engram. The running back is an issue, as no proven back returns, and junior Jordan Wilkins was ruled academically ineligible. On defense, Ole Miss loses quite a bit but should still be pretty good. Junior Marquis Haynes is the team's premier pass rusher now that Robert Nkemdiche is gone, and the front seven is helped by the addition of Oregon State grad transfer Rommel Mageo. The secondary has long been a strength for the Rebels under Freeze and it returns enough that it could be again in '16. The Rebels have enough pure talent and the quarterback to return to a New Year's Six Bowl. However, a poor running attack and tough schedule will make it tough to get over LSU or Alabama in the division. There were big expectations in Fayetteville last season, after Arkansas ended 2014 flaming hot and went 7-6. The Razorbacks struggled early but managed to find some consistency and finished off 8-5, capping off the year with a dominant Liberty Bowl win over Kansas State. Arkansas loses a lot of offensive production as they enter 2016; top back Alex Collins, solid QB Brandon Allen and tight end Hunter Henry all depart. Even with those losses, the Razorbacks will do what they have always done under Bielema: run the ball. Senior Kody Walker appears to be the next back, and will operate behind a strong O-Line. At quarterback, Arkansas is staying in the family by likely rolling with junior Austin Allen, the younger brother of Brandon. Austin has a slightly bigger arm and more upside than his brother, which could keep the passing game going. On defense, Arkansas has enough talent to hang with the talent inside the conference, led by senior middle linebacker Brooks Ellis, who will almost surely lead them in tackles. Despite some losses, Arkansas has built some stability in their program and they are always a tough team to beat because they take care of the ball and don't make many mistakes. That formula will keep them in the hunt for the SEC West crown in 2016. The pressure is on for Kevin Sumlin in College Station. Sumlin immediately became a big head coaching name after leading Texas A&M to a magical 11-2 2012 debut in the SEC behind the arm of Johnny Manziel. Since then, it has been uneven sledding for the head coach. The Aggies have started the last two years hot but has fallen apart in the second half, with two straight 8-5 records. Pair that with plenty of drama and chaos involving quarterbacks transferring, and Sumlin is on the hot seat. The good news is that the cupboard is far from bare at Texas A&M. The Aggies hope they have found a stable QB in Oklahoma grad transfer Trevor Knight, who has talent and potential, but has struggled to deliver. He has an exciting receiver corps to work with, headed by senior Josh Reynolds and do-it-all true sophomore Christian Kirk. Defense has not been the Aggies' strength since joining the conference, but it took big leaps under new defensive coordinator John Chavis last season. Junior end Myles Garrett is a sack machine, and the defensive backfield offers safety Armani Watts and plenty of other playmakers. If the Aggies can open their season with a victory over UCLA and get some momentum going, they could very well be extremely dangerous. If not, Sumlin may be in search of a new gig this offseason. Kevin Sumlin is not the only SEC West coach with significant pressure on him entering '16. Gus Malzahn is out to prove that Auburn can reclaim the magic that occurred his first season, when the Tigers went 12-2 and were seconds away from winning it all. Since then, Auburn has gone 8-5 and 7-6, and looked extremely out-of-sync last season. Malzahn needs somebody to step up at quarterback after it was terrible last season. Sophomore Sean White has emerged as the starter for now, but JUCO transfer John Franklin III fits the offense a little better and has more upside. Running back is a critical part of Malzahn's offense and right now it is also a question, after expected starter Jovon Robinson was recently dismissed. Other than those issues, the rest of the roster is very talented and deep. The offensive line is great, the receiver corps has potential and on defense, Auburn returns Carl Lawson from injury at defensive end. Malzahn has shown he can work some magic with Auburn when nobody is expecting much, but that may be tough to do in an unbelievably deep SEC West. Making it to a bowl game should be expected, but much beyond that may be tough with the backfield in shambles. 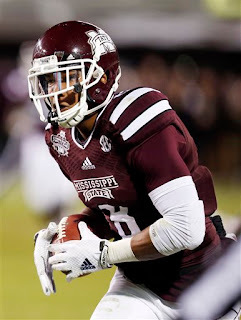 It has been a golden couple of years in Starkville, but everybody knew that one day Dak Prescott would have to graduate and he did this past season after leading Mississippi State to 19 wins over the past two seasons. Prescott's replacement at quarterback is uncertain, with sophomore Nick Fitzgerald and junior Damian Williams considered the top candidates. Other than having to replace the best quarterback in school history, Mississippi State has plenty of talent offensively. Senior receiver Fred Ross is an elite difference-maker, and senior Brandon Holloway should give solid production at running back. On defense, the Bulldogs lose plenty of pieces in the front seven but could still be stout up front, thanks to the return of seniors Will Coleman and Richie Brown and the arrival of a recruiting class that includes highly touted (and controversial) defensive ends Jeffery Simmons and Marquiss Spencer. From to bottom, Mississippi State still has a strong team and in most college football divisions, they would be in pretty good position. Unfortunately, without a proven QB in the brutal SEC West, they may struggle.